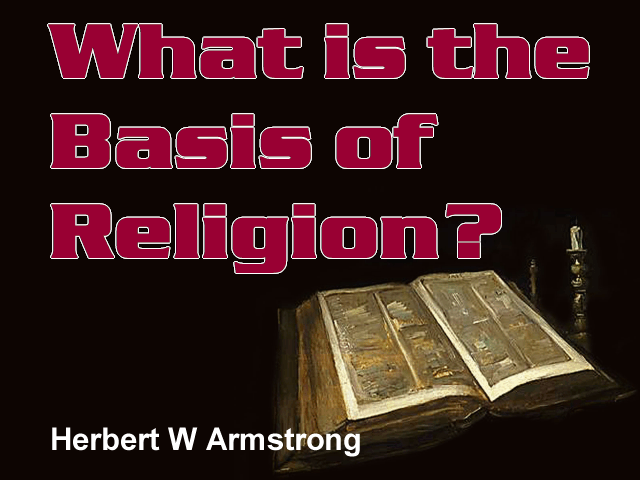 What is the Basis of Religion? Just what is the Worldwide Church of God, and how did I come into it? You know, in this program, I want to tell you something about my own life and how I came to come into the Worldwide Church of God, and the experience that I have had in my life. Up until age 16, I think I lived a life about the same as any other American boy. I had just one thing in mind, and that was a word spelled F-U-N, "fun." About all I thought of, I think, up until age 16, was fun. But at age 16 I had the first job of my life away from home, and the man I was working for would put his arm on my shoulder and tell me how well I was working, and about my performance, it was very good, and that he could see in me abilities, and that he knew I would go places in the world. And he kept telling me this kind of thing, and encouraging me, and somehow he aroused ambition in me. And I came to realize that ambition was just two things. Of course, it's a desire, a desire to succeed and to have, but also it is the resolution to work and to produce that desired result. And it doesn't come easy, and I knew that. Immediately, I began to study more than just the high school lessons. I began to frequent the public library, and I was reading books in the line of business administration, and also in, on the shelves where the books on philosophy were located. I began to think more seriously about life, and at age 18, I found a book in the library called Choosing a Vocation. It put me through a self-study course of self-analysis, then it took me through a survey of various occupations, various kinds of jobs and professions, and it seemed to me that I fit in the advertising profession. Now at that time, advertising had nothing to do with television commercials. No one had ever heard of television at that time. No one had ever heard of radio. There was no such thing as radio or television. I'm talking now about, let's see, about 1900 and 8 or 9 [1908 or 1909], and way back when, before the days of either radio or television. And advertising consisted of mostly of newspaper and magazine advertising. Of course, there were billboards, streetcar cards, and direct mail, and few things like that, but primarily it was newspaper and magazine advertising, and I was interested in writing copy for advertising in magazines of newspapers. And so, I took up the advertising profession. Now at that time, there was no school, or no college or university anywhere in the United States that had a course in advertising, in merchandising, that was worth attending. My uncle, my father's younger brother, was the leading advertising man in the state of Iowa, and he was the first president of the state association, and so I naturally went to him for advice. And he told me that if I would procure the books, and if I spent my evenings in study, and if I would apply myself, I could get just as good an education and perhaps better out of college than I could in. He said, "Education doesn't necessarily consist of traipsing over the doorsill of a college classroom or sitting in an armchair before a college lecturer." However, I realized too, that education consisted to some extent with contact with others who have an influence over you, and who can teach you. An education consists of study, it consists of thinking, it consists of mixing minds with other people, it consists of travel, it consists of observation and thinking and action. And so, I decided that I had the ambition and the desire to work, and I would get my education in that way. Well, I was quite successful. Now he told me to start on a daily newspaper; they didn't need any help. And so, I had to convince them that they did need help, that they didn't find ambitious young men very often like I was, and that they were going to miss something if they didn't hire me. And somehow, I guess my young bravado must have convinced them; I got the job. And pretty soon, the rival newspaper was offering me a 33 1/3% advance in salary if I would come over to them, because I was taking too much business away from them, in the advertising department. Well, to make a long story short, I went on. I was in the newspaper for a year, and then I was in the magazine field with the largest trade journal in the United States. For them, I handled the advertising copy for a trade journal agency, as we had established there, and part of the time, I traveled all over the United States for editorial material for the magazine. And finally, by age 28, I was making what in today's dollar value (with inflation) would amount to about a third of a million dollars a year, and I think not many young men of 28 today have advanced quite to that extent. Then later, and it was in 1926, late in the fall of 1926, I had a strange experience. I had lost all interest in religion at age 18. My whole interest was in business. I had dropped out of church attendance. I remember that my wife and I, shortly after we were married, had joined a Methodist church because it was close at hand in the suburb of Chicago where we lived, and we like the preacher, and we liked the people socially, and I think that we joined it just like most people join a church. It never occurred to me why should there be a church, and what is the purpose of a church, or anything like that. I just supposed all good people went to church. And I wanted to be good, and wanted to be respected, and so we joined the church. Otherwise, I had no special interest in religion, but as I say, it was at age 34, late in 1926. My wife took up with something that I considered absolute religious fanaticism, and I was absolutely shocked, because I was very much in love with my wife. Our marriage did last 50 years, until she died. And, but our marriage was threatened, because I wondered, "What would business colleagues think?" My wife had taken up with what I regarded as "the Jewish Sabbath," Saturday instead of Sunday. Now can you imagine that? To me, that was outrageous, and that was way out. And I said to her, "The Bible teaches that you must observe Sunday, thou shalt observe Sunday." She says, "Have you seen it in the Bible?" I said, "No, I don't know much about the Bible." "Well, how do you know it's in the Bible then," she asked. "Well," I said, "because all the churches observe Sunday, and they get their religion out of the Bible, don't they?" Well she asked, "Well, do they? Do they?" "Well, certainly anybody knows that?" Well she said, "How do you know? You just take it for granted that they do. Why don't you look into the Bible and find out for yourself?" And that was a stinging challenge. Now about the same time, my sister-in-law, just fresh out of college, had come believing in the theory of evolution. And now, I had been a little bit interested in this theory of evolution. I'd never made an in-depth study of it; that wasn't one of the studies that I had gone through, because I was interested in the advertising profession primarily, and psychology, and things of that sort. But she said that, "Herbert Armstrong, you're downright ignorant. Anybody, all the colleges and universities accept evolution today." And indeed, I found that it was the basic concept, or the eyeglasses, through which they perceive and see all philosophies and all knowledge. And she said I was "plumb ignorant." Well, I had felt pretty proud of myself at that time, and I was not going to be called ignorant. I said to her, "I'll make an in-depth study of it." So I delved into the works of Darwin, and his great supporters, Huxley and Haeckels, and others, like there was Karl Vogt and Spencer, and others. I read up on everything. You know, their arguments were quite convincing. And I said, "Well, if evolution is true, there isn't any God." And I'd been brought up in Sunday school, and at least I just took God for granted and supposed there was a God. I would have said if you'd asked me, "Do you believe in God," I would have said, "Well, of course." Now I began to wonder, "Why did I believe in God?" I didn't know why. Most people don't know why they believe the things they do believe. They believe them because they've always heard them, because others do, because those around them, their peers believe, because they've read it or something of the kind. As an advertising man, I soon learned that people believe what they see in print. There's something about print that causes you to believe that whatever it says must be true. So I went into an in-depth study, and pretty soon my head was swimming, and I had to prove whether God does exist. What is the real source, or what is the real origin of human life? And is there any purpose to human life? And you know, I found there was certain evidences (supposed to be evidence of evolution), but they wouldn't prove anything unless it was already proved or established. And I found the only thing that possibly be proof was the claim that in the fossil specimens found in the rock strata of the Earth laid down first, the oldest rock strata, the fossil specimens were always very elementary, but in the fossil specimens laid down later, were found far more advanced fossil specimens, and tending toward greater intelligence. Then I wanted to know, "Well, how did they determine the age of strata?" And you know, I was a long time, months and months, searching through libraries and searching through every book that I could find on paleontology and on geology, on biology, and finally I found it in a book by Thomas Crowder Chamberlain, which was a college textbook. They say that because they know evolution is true, wherever they find the simple, elementary fossil specimens, even if it's on the top, that must have been laid down first, and if they find more advanced and complex fossil specimens showing advanced intelligence, even though that may be clear down on the bottom, and many other stratas on top of it, that was laid down last. Now how could nature do that? That was rather silly. And how did they know then, the age of strata? Simply because they said they knew evolution was true, and they only knew evolution was true because of the age of strata, which they proved by the fact that evolution was true, and they proved that by fossil specimens. It was a big laugh. I found that evolution gives no explanation of a world of amazing and awesome progress, as we have it today, and of minds that are able to produce such technological advancement as we have today, and scientific advancement, and yet minds that cannot solve their problems, a world that is so full of evils and troubles, and that troubles and evils are multiplying, and people don't know any way to solve their problems. I've talked with many heads of state in their own offices all around the world, and they all have problems that they can't solve. The problems are greater than the human minds can solve. And yet, they can send men to the moon and back. Why? I wanted to know why. Evolution can't give an answer. I found an answer in the Bible. Then I began to study the Bible a little bit more, and you know, I was stunned when I came to something in the book of Romans. It was chapter 6 and verse 23 (Romans 6:23), the last verse in the chapter. "The wages of sin is death," it says. Now, wages is what you get for performance, and if the performance is sin, what you get paid is death. Now I said, "That can't be right. I remember that even from Sunday school, I'd been taught that if you sin, you're going to go to hell for eternity, and you'll burn and burn and burn and never burn up." So I said, "Oh no, I can't agree with the Bible there." Then the last half of that verse stuck me even more: "But the gift of God is eternal life through Jesus Christ our Lord." Well now, if it's a gift of God, and I'm already an immortal soul, and I already have immortal life, why do I need it as a gift from God? I said, "Oh, how can I believe the Bible when it says things like that?" Then I went a little further in the Bible, and I'd learned to get concordances and extra things like that, and I found.... I looked up the word "soul," and I found that the Bible says in two different places: "The soul that sinneth, it shall die." It's not immortal, it's going to die. And that's repeated in two different places. Then I found that in the book of Genesis, it says, "In the beginning God..." (Genesis 1:1). And incidentally the word for God was written originally by Moses in the Hebrew language, and the word was Elohim, which was a plural word meaning "Gods", more than one person. And in verse 26 (Genesis 1:26): "And God said," or, "Elohim said, Let us," not "let me," "Let us make man in our image, after our likeness." And then in the next chapter, in the 7th verse (Genesis 2:7): "And the Eternal God formed man of the dust of the ground, and he breathed into his nostrils the breath of life, and man," that is, the dust of the ground, "became a living soul." Then the dust of the ground became a soul. A soul came out of the dust of the ground, not out of spirit. A soul is not spirit, and it is not immortal. And man only had a temporary, chemical existence, not an immortal life. And then God said to that soul that if he took of the forbidden fruit of the two trees before him, he would surely die. And Adam did take of that, and he could have taken of the Tree of Life. He didn't have life, but he was offered life by the Tree of Life in the Garden of Eden, and he had to make a choice. And the man rejected life from God. He would have received it from God, and that meant receiving the very spirit of God, the nature of God, the life of God that would be immortality. And he rejected that, and he took the tree of death, which was the Knowledge of Good and Evil. Now there is both good and evil in the human mind, as God made humans. I found the Bible shows that very well. And that the Bible showed that there a spirit in man, and it is a human spirit. I found that there are three levels of spirit mentioned. One is the spirit of God, and God himself is spirit. In John 4:24, I found that God is a spirit. He's composed of spirit. Man is composed of matter out of the ground. And then there are angels, and they're made of spirit, but they're spirit on a little lower level than God. They're not as great as God, and they don't have minds as great as God. Then man has a spirit, and I found in the book of Job, and elsewhere in the Bible, that there is a spirit in man, and that man could not know the things that man knows, and have human knowledge, except by the spirit of man that is in him. So there is a spirit in that soul, and the soul is made out of matter. And the soul is mortal. But the spirit gives to the physical brain the power of intellect. And pretty soon, I began to find that the Bible explained why the minds that can produce such awesome results today, still can't solve their problems. Their problems are spiritual. In man, we have trouble, and all the troubles in this world are caused by a spirit in one brain, clashing with the spirit in another brain. As long as man deals only with matter, and material substance, he does pretty well, and we have done very well. We have sent men to the moon and back. We put unmanned spacecraft on the surface of Mars, and sent back photographs. So I began to find that the Bible explains why we have that paradox in this world. And to make a long story short, I came to find out my wife was right, and that so many of the churches today do not preach what comes out of the Bible, but just the exact antithesis, the very opposite. They have drifted away from the Bible, and the Bible is the word of God! That is the word of God. And finally, I had to eat crow. I didn't want to; it wasn't anything I wanted. But I found that Jesus Christ said the Sabbath was made for man, and not man for the Sabbath, and therefore the son of man, or Jesus Christ, is Lord of the Sabbath day. And the Sabbath day is the seventh day of the week, according to the Bible. So that is the Lord's Day. Now it was made for man. I looked back in the book of Genesis. We find the creation chapter in chapter 1 of Genesis, in the beginning of the Bible. And in Genesis the 2nd chapter, we find that after he had worked for six days, that God rested the 7th day and put a blessing on that day, and set it apart for holy use and purpose, because he had rested on that day, and because it was.... It pointed right back to creation, and creation is the proof of God, to keep us in the knowledge of who the true God actually is, after all. I found the Sabbath was all the way through the Bible. I found in the New Testament, let me see, that was in, I believe, the 18th chapter of Acts — the apostle Paul, sent just to the Gentiles. And some people say that all the law was done away. Paul was preaching to the Gentiles on the Sabbath day for a year and a half, only to Gentiles after he turned away from the Jews. Jesus Christ kept the Sabbath, the early apostles and the church kept the Sabbath day. Now then, what is the church of God? I haven't had time to go into that in this program. Let me send you a booklet: Where is the True Church? I have a copy right here. Where is the one true church? Jesus Christ said in Matthew 16, verse 18 (Matthew 16:18): "I will build my church." And he didn't say "churches." And we find all kinds of churches and different denominations. He said, "I will build my church." There's only one church. Where is that true church today? I'd like to give this to you gratis, no charge, no obligation. Then, here's another book, since I have mentioned about the Sabbath. That is the question I had to look up. I didn't have time to go into very much on it. There's a very lot in the Bible about it. Which Day is the Christian Sabbath? (Of the New Testament.) Is it Sunday? And is Sunday the Lord's Day? And how did that get started? Let me send you this booklet, if you're not afraid to have your eyes opened, and I certainly had my eyes opened. I wondered, "Where is the true church?" I had to find it. But here is, on the Christian Sabbath, and the booklet on where is the true church? Where is the True Church? Now also, once again, those of you who have not received the booklet that we've been offering for 50 years now or more, United States and Britain in Prophecy. Over three and one-half million people have requested this booklet, and they find it is an eye-opener, and it shows you where the United States is mentioned in the Bible prophecies again and again and again, and it shows you what prophecy says is going to happen to the United States in the very next few years now. It's going to happen to you. Do you want to know what you're going to live through? You need this booklet, if you are not one who already has received it: United States [and Britain] in Prophecy. So write in for one of those, and we'll give you a year's subscription to The Plain Truth, the finest magazine published in the world. It has a circulation larger than any news magazine, and it is a news magazine. It has a circulation larger than almost any family magazine, or human interest magazine, and it is that too. And it carries the plain truth. And there's no subscription price, and it carries no advertising. It's not commercial in any sense at all. It's just packed full of marvelous articles right up to date. It's one of the greatest magazines in all the world. Now, you just send your request to me, Herbert W. Armstrong, Pasadena, California. Herbert W. Armstrong, Pasadena, California, the zip is 91123. Or, many people would rather just go to the telephone and get it immediately, so go to the telephone, and there's a free call. You dial 1, then 800-423-4444. 800, then 423-4444. And so until next time, this is Herbert W. Armstrong. Goodbye, friends.